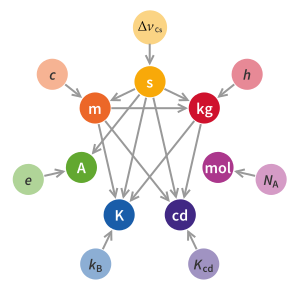 A number of authors have published criticisms of the revised definitions – including that the proposal had failed to address the impact of breaking the link between the definition of the dalton[Note 2] and the definitions of the kilogram, the mole, and the Avogadro constant. ^ Technically, the mass of the International Prototype Kilogram is no longer a "physical constant", as it is abandoned as a reference in the new SI. ^ Although the calculation of the uncertainty implies that the fine structure constant isn't a significant factor, because of rounding errors, the uncertainty in the fine structure constant does have an effect on the determined value. ^ a b Kühne, Michael (22 March 2012). "Redefinition of the SI". Keynote address, ITS9 (Ninth International Temperature Symposium). Los Angeles: NIST. Archived from the original on 18 June 2013. Retrieved 1 March 2012. ^ a b c d e f "Draft of the ninth SI Brochure" (PDF). BIPM. 28 December 2018. Retrieved 20 March 2019. ^ "Historic Vote Ties Kilogram and Other Units to Natural Constants". NIST. 16 November 2018. Retrieved 16 November 2018. ^ "Metric Convention of 1875 [English translation]". Washington, D.C.: Office of the President of the United States. 1876. Archived from the original on 1 March 2005. ^ "The Metre Convention". Sèvres, France: International Bureau of Weights and Measures. Retrieved 21 June 2013. ^ "CIPM: International Committee for Weights and Measures". Sèvres, France: BIPM. Retrieved 3 October 2010. ^ "Resolution of the 1st meeting of the CGPM (1889)". Sèvres, France: International Bureau of Weights and Measures. Retrieved 21 June 2013. ^ Jabbour, Z.J. ; Yaniv, S.L. (2001). "The Kilogram and Measurements of Mass and Force" (PDF). Journal of Research of the National Institute of Standards and Technology. 106 (1): 25–46. doi:10.6028/jres.106.003. PMC 4865288. PMID 27500016. Archived from the original (PDF) on 4 June 2011. Retrieved 28 March 2011. ^ "Resolution 6 of the 9th meeting of the CGPM (1948): Proposal for establishing a practical system of units of measurement". Retrieved 23 March 2011. ^ "Resolution 12 of the 11th meeting of the CGPM (1960): Système International d'Unités". Sèvres, France. Retrieved 23 March 2011. ^ Mohr, Peter (6 December 2010). "Recent progress in fundamental constants and the International System of Units" (PDF). Third Workshop on Precision Physics and Fundamental Physical Constants. Retrieved 2 January 2011. ^ Whipple, Tom (7 January 2013). "The dirty secret of why you are not quite as heavy as you think". The Times. London. p. 15. Retrieved 23 March 2011. ^ Ghose, Tia (6 January 2013). "The Kilogram Has Gained Weight". LiveScience. Retrieved 23 March 2011. ^ a b Crease, Robert P. (22 March 2011). "Metrology in the balance". Physics World. Institute of Physics. Retrieved 28 June 2012. ^ Fischer, J.; et al. (2 May 2007). "Report to the CIPM on the implications of changing the definition of the base unit kelvin" (PDF). Retrieved 2 January 2011. ^ "Resolution proposal submitted to the IUPAP Assembly by Commission C2 (SUNAMCO)" (PDF). International Union of Pure and Applied Physics. 2008. Retrieved 6 September 2015. ^ Mills, Ian (29 September 2010). "On the possible future revision of the International System of Units, the SI" (PDF). CCU. Retrieved 1 January 2011. ^ Mills, Ian (29 September 2010). "Draft Chapter 2 for SI Brochure, following redefinitions of the base units" (PDF). CCU. Retrieved 1 January 2011. ^ "Resolution 12 of the 23rd meeting of the CGPM (2007)". Sèvres, France: General Conference on Weights and Measures. Retrieved 21 June 2013. ^ "Towards the "new SI"". International Bureau of Weights and Measures (BIPM). Retrieved 20 February 2011. ^ "On the possible future revision of the International System of Units, the SI – Draft Resolution A" (PDF). International Committee for Weights and Measures (CIPM). Retrieved 14 July 2011. ^ "Resolution 1: On the possible future revision of the International System of Units, the SI" (PDF). 24th meeting of the General Conference on Weights and Measures. Sèvres, France: International Bureau for Weights and Measures. 21 October 2011. It is not expected to be adopted until some prerequisite conditions are met, and in any case not before 2014. See "Possible changes to the international system of units". IUPAC Wire. 34 (1). January – February 2012. ^ "General Conference on Weights and Measures approves possible changes to the International System of Units, including redefinition of the kilogram" (PDF) (Press release). Sèvres, France: General Conference on Weights and Measures. 23 October 2011. Retrieved 25 October 2011. ^ Mohr, Peter (2 November 2011). "Redefining the SI base units". NIST Newsletter. NIST. Retrieved 1 March 2012. ^ Mills, Ian (September – October 2011). "Part II – Explicit-Constant Definitions for the Kilogram and for the Mole". Chemistry International. 33 (5): 12–15. ISSN 0193-6484. ^ a b "The BIPM watt balance". International Bureau of Weights and Measures. 2012. Retrieved 28 March 2013. ^ Taylor, Barry N (November – December 2011). "The Current SI Seen From the Perspective of the Proposed New SI". Journal of Research of the National Institute of Standards and Technology. 116 (6): 797–80. doi:10.6028/jres.116.022. ^ "Unit of electric current (ampere)". Historical context of the SI. NIST. Retrieved 7 September 2015. ^ Orfanidis, Sophocles J. (31 August 2010). Electromagnetic Waves and Antennas (PDF). ECE Department, Rutgers University. 1.3 Constitutive Relations. Retrieved 24 June 2013. ^ a b c d Chyla, W.T. (December 2011). "Evolution of the International Metric System of Units SI" (PDF). Acta Physica Polonica A. 120 (6): 998–1011. Retrieved 22 June 2013. ^ "What is a mise en pratique?". BIPM. 2011. Retrieved 6 September 2015. is a set of instructions that allows the definition to be realised in practice at the highest level. ^ "Recommendations of the Consultative Committee for Amount of Substance: Metrology in Chemistry to the International Committee for Weights and Measures" (PDF). 16th Meeting of the CCQM. Sèvres: Bureau International des Poids et Mesures. 15–16 April 2010. Retrieved 27 June 2012. ^ "Recommendations of the Consultative Committee for Thermometry to the International Committee for Weights and Measures" (PDF). 25th Meeting of the Consultative Committee for Thermometry. Sèvres: Bureau International des Poids et Mesures. 6–7 May 2010. Retrieved 27 June 2012. ^ "kilogram NOW – Realization of the awaited definition of the kilogram". European Association of National Metrology Institutes. Retrieved 8 October 2012. ^ Mohr, Peter J. (2008). The Quantum SI: A Possible New International System of Units. Advances in Quantum Chemistry. 53. Academic Press. p. 34. Bibcode:2008AdQC...53...27M. doi:10.1016/s0065-3276(07)53003-0. ISBN 978-0-12-373925-4. Retrieved 2 April 2012. ^ "Universe's Constants Now Known with Sufficient Certainty to Completely Redefine the International System of Units" (Press release). NIST. 22 November 2016. Retrieved 31 December 2016. ^ Conover, Emily (16 November 2018). "It's official: We're redefining the kilogram". Science News. Retrieved 16 November 2018. ^ a b c Foster, Marcus P (5 October 2010). "The next 50 years of the SI: a review of the opportunities for the e-Science age". Metrologia. 47 (6): R41–R51. Bibcode:2010Metro..47R..41F. doi:10.1088/0026-1394/47/6/R01. Retrieved 24 June 2013. ^ Censullo, Albert C (September – October 2011). "Part I – From the Current "Kilogram Problem" to a Proposed Definition". Chemistry International. 33 (5): 9–12. ISSN 0193-6484. ^ Burns, D Thorburn; Korte, EH (2013). "The Background and Implications of the "New SI" for Analytical Chemists" (PDF). Journal of the Association of Public Analysts (Online) (41 2): 28–44. Retrieved 25 June 2013. ^ Leonard, B.P. (2010). "Comments on recent proposals for redefining the mole and kilogram". Metrologia. 47 (3): L5–L8. Bibcode:2010Metro..47L...5L. doi:10.1088/0026-1394/47/3/L01. Retrieved 15 September 2013. ^ "Mise en pratique for the definition of the kelvin" (PDF). Sèvres, France: Consultative Committee for Thermometry (CCT), International Committee for Weights and Measures (CIPM). 2011. Retrieved 25 June 2013. ^ Consultative Committee for Thermometry (CCT) (1989). "The International Temperature Scale of 1990 (ITS-90)" (PDF). Procès-verbaux du Comité International des Poids et Mesures, 78th Meeting. Retrieved 25 June 2013.
International Bureau of Weights and Measures (BIPM) (10 August 2017). "Input data for the special CODATA-2017 adjustment". Metrologia (Updated ed.). Retrieved 14 August 2017.